Hello, PakWheelers! 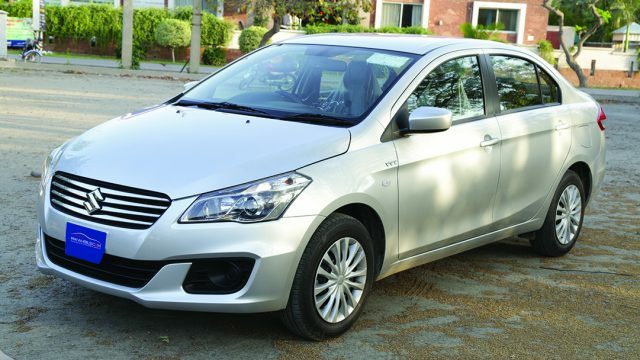 Today’ test drive and review are all about Suzuki Ciaz, Pak-Suzuki’s most recent take on the sedan market. The car in question is a CBU imported from Thailand and has been introduced in two variants, manual & automatic. The A/T variant has been priced at Rs 1.99 million, whereas M/T has been priced at Rs 1.859 million. 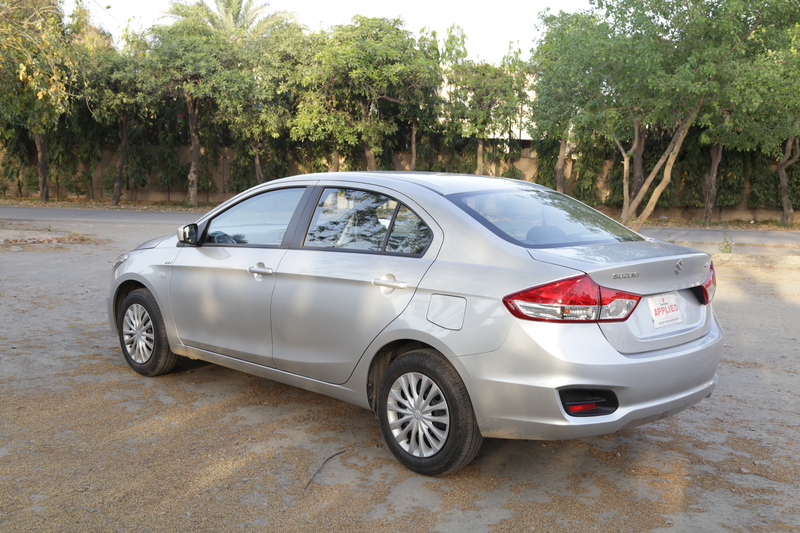 As for this review, we’ve been using the top-of-the-line Suzuki Ciaz A/T. By design, this sedan is an outright attempt to one-up Toyota and Honda. 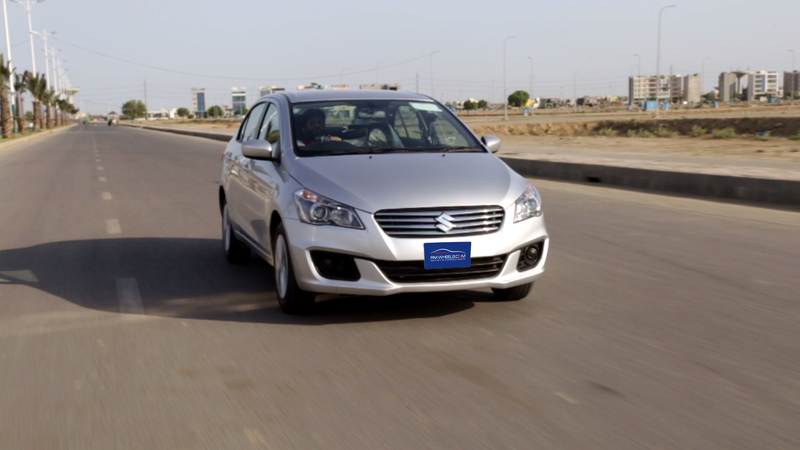 In the past, Pak-Suzuki has tried its luck with the likes of Margalla, Baleno, and Liana. In-line with its cryptic name, the Ciaz strikes as a mystique combination of subdued and offensive looks. Since it is essentially a CBU, it is pertinent to mention that Suzuki has recorded couple of hits with the styling of its compact cars, chiefly Suzuki Swift. 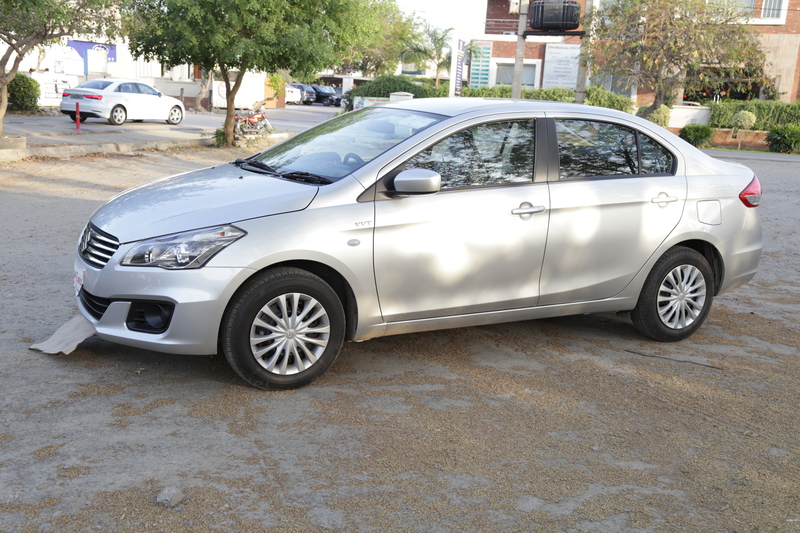 Following the precedents, Ciaz is a well-proportioned and finely made vehicle. The addition of creases along its door sills makes its side profile more appealing as well as give an impression of an aesthetically long vehicle. Indeed Ciaz trumps Honda City in terms of its length by a convincing 95mm as well as width and ground clearance. The car is a beautiful culmination of modern aesthetics with sporty looks making it look very similar to BMW 3-Series from the back. We talked about the wonderfully designed creases along the door sills but the accented presence of reflectors on the rear bumper of Suzuki Ciaz gives it a more refined look from the rear end. All and all saying it’s a mini Kizashi with some elements of BMW 3-Series will be appropriately defining it. The doors are appropriately designed to offer good space to get inside and step outside the cabin, and since it is a CBU, the paint and build quality are superb. Pak-Suzuki is offering this car with standard fog lamps. The highlight of Suzuki Ciaz is its maneuverability and the amount of space it offers to the consumers. The car is impressive with its 5.4m of turning radius. Last but not the least, we think had Pak-Suzuki added chrome lining along door handles and a chrome garnish on the boot lid, then this car could’ve been even more appealing looks to the buyers. Stepping inside the cabin gives the vibes off an efficiently manufactured product, the use of chrome and black strips to highlight the accents at various locations, including separation in the dashboard, around doors, etc. yields out a very cohesive look. The materials used to build this car are excellent both, in their feel and looks. But that is not the only surprise, Ciaz’s information cluster bears an uncanny resemblance to the Suzuki Vitara; it features both, an RPM meter along with a speedometer. The information cluster also features a TFT display, which outputs the current gear, exterior temperature, and cruising range. The glowing LED strips imbued in the speedometer allows the driver to subliminally feel the performance of this car. 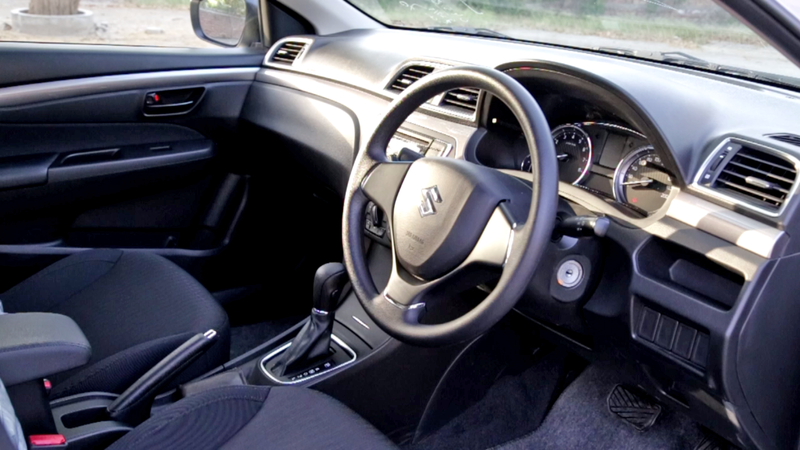 Prioritizing the ergonomic design, Suzuki has fitted this car with intelligently designed cup holders, which offers plenty of space for miscellaneous items, coupled with a 12V charging dock, the bottom console addresses pretty much all the basic needs for the driver and front passenger. 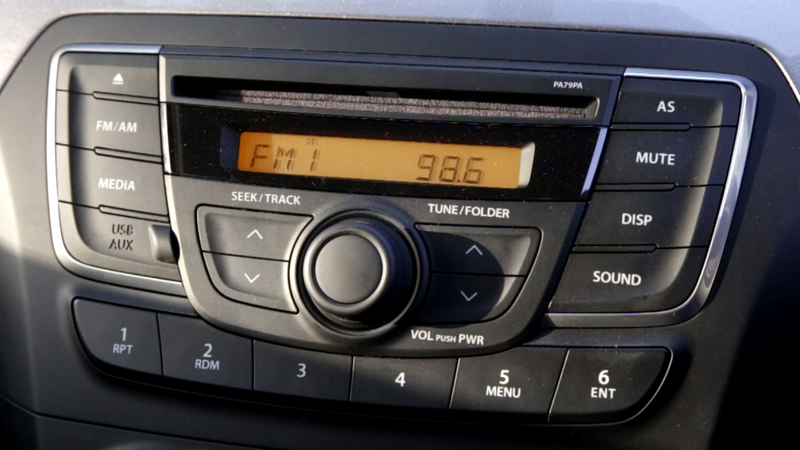 The car comes with a factory fitted Panasonic head unit with audio, aux, USB, AM/FM and CD support. 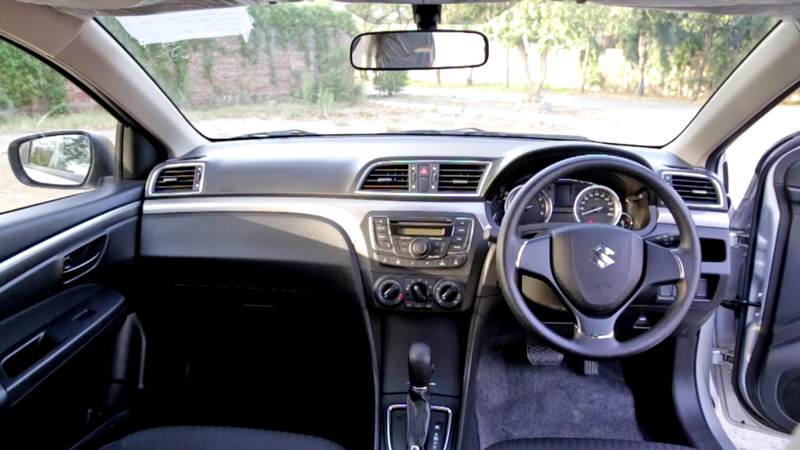 Talking about upholstery, Pak-Suzuki is offering this car with fabric seats, which not only is by the warm temperatures of Pakistan but are also very driver friendly. With lumbar support, the seats are very posture friendly and marginalize the muscle soreness on long drives. Last but not the least is the driver’ height adjustment, which allows the freedom to adjust the seat height according to driver’ preferences. Time and again, we’ve highlighted the fact that imported CBU’s tend to have better noise reduction inside the cabin, maybe it’s the use of build materials, or it could be something else but the fact remains that these vehicles offer a lot more value to the consumers in terms of reliability and build quality. The same principal applies to Suzuki Ciaz, as the noise reduction inside the cabin is extremely efficient. There is an old saying ‘Never judge a book by its cover,’ and this car proved this saying once again with its supreme boot space and interior legroom. 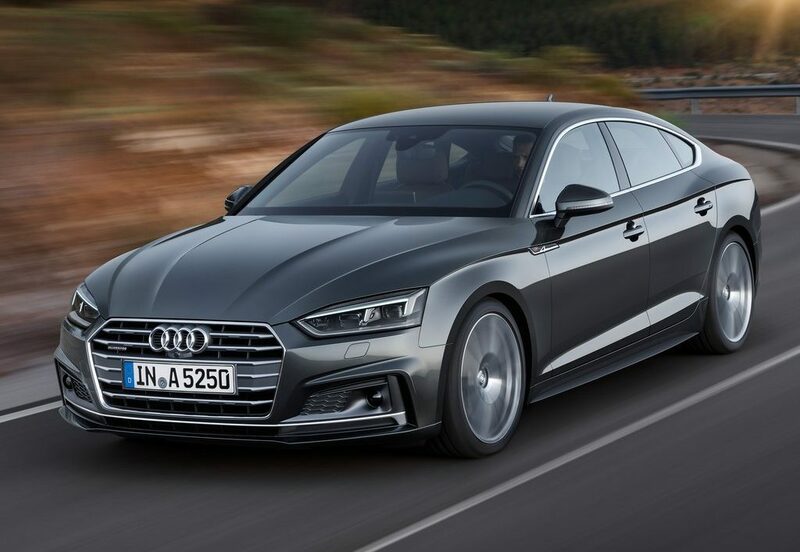 On the surface, this car gives strong looks with its aggressive design cues but open up its boot or step inside the cabin, and you will be surprised to see how well the interior space has been managed. Extending the driver seat to the last point will still leave you with more than 10-12 inches of legroom at the back, which makes one wonder – is this car manufactured in-line with the long wheelbase requirements in Chinese Premium Car Market? And then there is the boot space, with the 510L worth of boot space you will be very hard pressed to fill it up, we placed two full sized attaches and two trolley bags inside, surprisingly there was still room for more luggage. Pak-Suzuki is offering features electrically adjustable side mirrors with manual dimming rear view mirrors. Suzuki has developed this car by considering the modern day requirements of any consumer. Safe to say this car has a flat rear bed, which allows a very generous amount of legroom and seating space for a third adult in the rear seat. Suzuki Ciaz has been offered with both automatic and manual transmission, but as mentioned earlier, we were driving the car with the 4-Speed Automatic transmission. This car features an OverDrive button, which used to be a common sight in the old Land Cruisers. Once pressed, this option brings down the engine RPM’ on higher gears to save off fuel on highway cruising. So it is pleasing to see this feature being offered after a long time. Regarding performance, we tested the 0-100 KM/H for this car, and it achieved this feat in 14 seconds, which is pretty impressive for a 1.4L naturally aspirated engine. 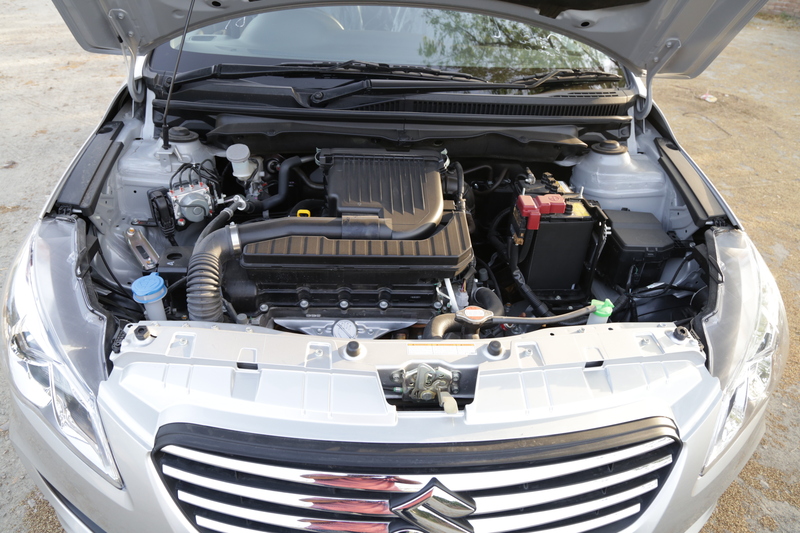 Ciaz outperforms both City 1.5 ASPIRE and GLi in both performance and fuel economy. We drove this car all day in all sort of driving conditions (including performance, city, and highway) and surprisingly it gave us a respectable mileage of 13 KMPL and we believe driving this car with a soft foot can yield out a 15-16 KMPL fuel average very easily. The A/C was superb, and its suspension was up-to-the-mark imparting a very comfortable ride experience. The car has a seating capacity of five people, but with this many adults onboard, it struggles to cope with an abnormal speed-breaker. However, if you’ve four people sitting inside the car, then it can easily skip over anything you throw at it. It handles brilliantly at low speeds, however, at high speeds, any experienced driver can tell the difference. The solution can be found easily by fitting in some wider tires which will enable you to fully enjoy the smooth drive this car has to offer. With two SRS airbags and multiple crumple zones, coupled with ABS+EBD, Ciaz is the leading vehicle in its class regarding passive and active safety systems designed to protect the life of passengers. Yes, the price point for this car is a little higher but considering the fact of high premium rates and wait time on its immediate competition, we believe this is a good option in this price bracket. The build quality is superb, which has become a rarity in locally manufactured products and then add the Pak-Suzuki’s nationwide 3S dealership network; this car is a bargain for Pakistani auto consumer to get away from ridiculous Premium rates and outlandish booking times. Last but not the least, the company could’ve introduced some international options in this car to show appreciation to their customers.